Yes - we've had several of my best trips in YEARS. That DOES NOT MEAN IT'S ABOUT TO HAPPEN AGAIN!! ("Ah, Capt., I thought we'd catch 20 pounders today?") Oh Mercy! to 5:30 - $150.00 - 16 Sells Out..
24,058 Reef Blocks have been deployed at numerous sites. (Site totals not updated since 1/22/19..
After getting my head handed to me last winter, I feel fortunate indeed to get some trips this January/February. While some have been miraculous including three 19 pounders, most were not. Tis the nature of the beast. As I write, some 40 minutes into my Super Bowl Sunday trip, we've had 5 fish over 10 lbs, make that 6: it's the best bite yet in this series of trips. But these are the fish these die-hardblackfishermen want to catch this time of year. A tog that, though drag set very tight, can pull against it for 30 or 40 feet; the powerful tail thrusts thumping as none of our other reef fish are capable. So we go - and gamble. They do not always bite.. Not at all. I've written fairly extensively on how we can make toggin better; have put a lot of work into just that with reef building & comments on regulation. . .
A couple years back I irritated the powers that be with my claim survey work off Ocean City was pushing sea bass and flounder off 500 square miles of bottom. Wrote about it a lot. Took out an ad in a local paper during White Marlin Open week: "Hey NOAA, Hey BOEM, Hey MARCO! We want our sea bass back!" Surveys in the Maryland Wind Energy Area (MDWEA) had gone on way too long, for 3.5 years, and had literally evacuated all the bottoms within 3 or 4 miles of the already huge Wind Area. Now I personally support Wind Energy development. Similar to the Gulf of Mexico's oil rigs, it will be the greatest boon ever to our reef fisheries - Ever. I also happen to think the good folks who can put a bunch of satellites up that give me precise positioning, who offer cell service around the globe, and who can see inside your brain magnetically, or sequence genes to determine likelihood of illness — Yes, those folks, those scientists, can read a bunch of thermometers and see that the earth is warming. Those same folks think the atmosphere is getting too much CO2 and it's vital that we reduce emissions. Another thing CO2 emissions do is increase ocean acidification. First thing to go will be shell formation. Water's too acidic? No shell. Clams, scallops, oysters, whelk, conch, crabs, shrimp; all these vital commercial fisheries would die fighting, while some men today are reluctant to share the seafloor with anyone else. I listened to a group of British trawl skippers give a presentation to the Mid-Atlantic Council. While they had indeed lost fishing ground to 'The London Array' a huge fully developed wind field, they said small boat trap fishers, like conch potters, had benefited big time. So the very thing that can prevent, or at least lessen, catastrophic ocean acidification also benefits most fisheries. So I'd raised the devil about these 'subbottom profiler' surveys. Didn't make me any friends in guvmint - promise. Yet I was certain - 100% positive - the complete disappearance of sea bass & fluke from this enormous area was at the fault of subbottom profilers - the survey boats. BOEM claims this survey equipment "is as quiet as a ship's propeller" ..and maybe so. But it scares the bejeezus out of some fish. If we saw a single sea bass all day, I don't recall it. Did see tog and even a few cod though. In 2007 I was very excited to have my friend, Capt Rick Younger, come to our newly permitted reef site where we were hoping to site railcars. His state boat was equipped with all manner of survey gear, including a subbottom profiler. I was anchored at the Jackspot over an existing wreck the day Rick came in to do his state-required reef site survey. 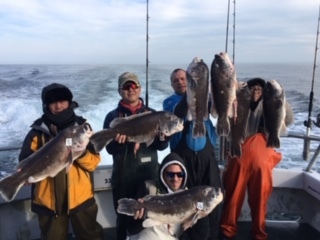 Clients were catching like mad - what we call a "drop & reel bite" of sea bass. As Rick turned into his first leg - the bite turned off as if by a switch. And it was a switch. He'd turned on his subbottom profiler and the fish quit. I asked what he'd turned on — and would he please turn it off! — the bite resumed at a more tepid pace. My second unquestionable encounter with this survey gear was (circa June of 2013). By then I could tell when a survey boat was 7 miles away and coming. As the fish slowed I'd turn on my radar; I could see the bite taper as the boat closed & then quit absolutely when a survey boat was 3 miles away. The southernmost point of these surveys was about 2.5 miles above our largest, most developed artificial reef, the Great Eastern Reef. It was there one day when the survey boat came to a halt at its southern most point. Clients were catching nothing when, quite suddenly, the bite turned on around the rail. A helicopter was coming in for a landing on the survey boat. We caught sea bass & fluke in good number. Clients, who had no idea what was actually happening, were whooping & hollering, "This is the spot Capt!" About 40 minutes passed and the helicopter departed - the Shearwater was back underway ..and the bite died completely again. I hailed the survey boat on VHF 16 and switched to channel 10. I asked if they'd turned off their subbottom profiler. After a few minutes the radio operator replied, "Yes, they'd shut down the survey equipment while the helicopter was aboard." At that point I'd been sea bass fishing 33 years. I knew their behavior. It wasn't a current switch or fishing pressure; these two examples clearly illustrate how a subbottom profiler stops sea bass from feeding. What I didn't realize at that early stage of the surveying was that, eventually, enough of this survey noise, 3+ years of it, would drive the fish completely out of the MDWEA and for at least 3 additional miles around the entirety of it's perimeter. I had the impacted area measured by some folks who are extremely skilled with charting - it was just over 500 square miles. Man, that was a lot of telling to get to my whale idea.. Off the mouth of the Chesapeake humpback whales congregate each winter. Unfortunately, they stay primarily in the shipping lanes. Ship strikes are nearly always fatal. Although sea bass and fluke are certainly higher order animals, I wonder if the menhaden & bay anchovies might also be susceptible to subbottom profiler influence. If we can move these giant shoals of bait away from the shipping lanes, the whales will follow. Or perhaps they will be irritated by these sounders themselves and move regardless what their food does.. Either way, it's worth a shot. MD has a boat equipped with subbottom sounders, I would assume NOAA & Virginia do as well. BOEM still maintains their survey work does nothing to fish - nothing at all. Why, "it's as quiet as a ship's propeller..."
Maybe another agency will try this idea - keeping whales out of harm's way would be a good thing.